JORDAN Winbourne was described as “very gracious in defeat” after losing his first international final in a seventh-frame decider. The Hedge End teenager (pictured) led 2-0 and 3-2 before going down 4-3 to Scottish international Dylan Craig in the EBSA European Under-18 Open Championship at the South West Snooker Academy, Gloucester. “It was a good final to be involved in,” admitted the 17-year-old. Winbourne had won his previous six matches without dropping a frame. After cruising through five group-stage matches, he accounted for Kobe Vanoppen (Belgium) 3-0 in the last-32. He then beat Thomas Hilborne (Trowbridge) and Haydon Pinhey (Plymouth), both 4-1, and Brandon Sargeant (Stoke) 4-0 in the semi-finals. Meanwhile, Shane Castle, who claimed the MIUS Cup last year, progressed to the knockout despite miss-reading his schedule and failing to show for one match. The 15-year-old from Marchwood compiled a 75 break in a last-32 victory over Calvin Gourlay (Scotland), beat Ben Fortey (Gloucester) 4-1 in the last-16 but went down 4-3 to Darryl Hill (Isle of Man) in the last-eight. Jordan Winbourne: 3-0 Sybren Sokolowski (Belgium), 3-0 Joseph Taylor (London), 3-0 Chris Totten (Scotland), 3-0 Tyler Rees (Wales), 3-0 Thomas Hilborne (Trowbridge). Breaks: 76, 59, 59. Shane Castle: 3-2 Wan Sin Man (Hong Kong), 3-0 Brandon Sargeant (Stoke), lost (walkover) to Kieran Phillips (Leicester), 3-0 Jan Corten (Belgium), 3-0 Lewis Parnham (Gloucester), 3-0 Oliver Hilborne (Trowbridge). Breaks: 59, 50, 50. 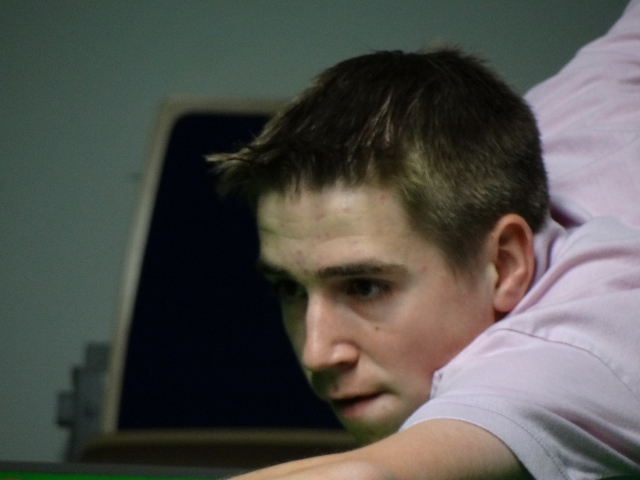 Picture by Janie Watkins (southwestsnookeracademy.com): Jordan Winbourne in action in Gloucester.